There have been gift guides galore allover in the interwebs already. I am either late to the game or really I felt like people were rushing it!!! I had every intention of starting these last week, after Thanksgiving..... however last week was totes crazy pants for me at work! I love CHristmas, but personally have to wait until after Thanksgiving to get 'in the mood' (although I was done holiday shopping months ago!) But my two projects are done, after a looooong day of work on Saturday! So I was finally able to breathe and format some posts for you loves!!! Personally this one might be one of my favorites!!! Quirky, thoughtful and unique! The perfect combo when picking out a gift! That little piggy bank would be perfect young to old, I'd personally write 'NEW PURSE!' or SHOES across her belly! And the fish corkscrew would be so fun for all the men on my list! Oh those cocktail cups are freaking adorable!! love your picks! 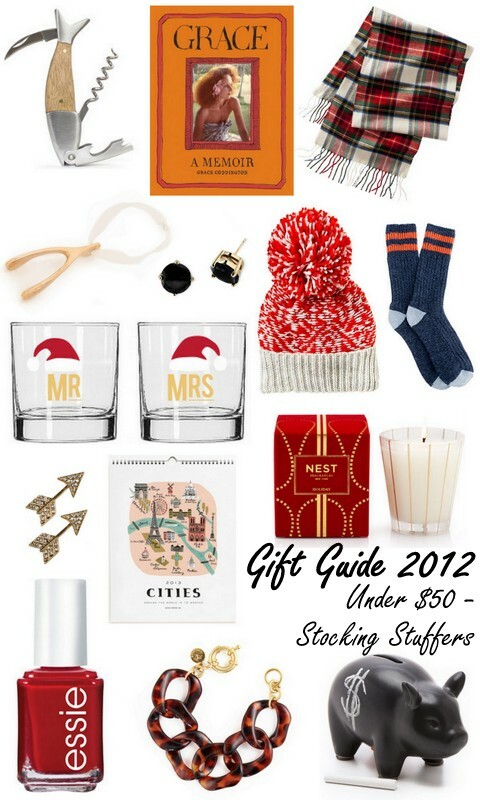 I can never get enough gift guide inspiration! I love that calendar, great picks! These are such great picks, I personally would love all of them under my tree! love those mr & mrs santa glasses! those santa mugs are just adorable!! LOVE the piggy and those earrings are PERF!!! great guide and totally agree - they started so early this year! Love those cozy-looking socks and the adorable earrings! I love the wishbone ornament. it is so unique! Great picks! Especially love those Mr. and Mrs. glasses.